The wealthy often kept sets, or consorts, of instruments such as the recorder, and in modern times playing recorders of various sizes and pitches together has become a popular form of both professional and amateur music making. Yet hardly any Renaissance music was written specifically for the recorder. Rather, like the vocal music of the period, 16th-century music for instrumental ensemble was printed in sets of part-books designated only by their range: soprano, alto, and so forth. Players presumably made their own arrangements of such music, matching each part to an instrument of suitable type and range while adding ornaments and other idiomatic touches to the written notes. Thus, in place of unwritten improvisation by individual performers, we heard something that evidently had been meticulously prepared ahead of time—indeed, well ahead of time, as most of the program reproduced that of a CD issued earlier this year. To be sure, “improvisation” today, whether in jazz or early music, is usually a mix of formula and invention. In principle, a performance whose details are all prepared in advance could sound as spontaneous as one that is arranged or embellished on the spot. This one was well played, and received enthusiastic applause from the Jordan Hall audience. But I’m afraid that I was unable to share that enthusiasm. The program consisted of close to two dozen pieces by 17 composers, under the title “Angeli, Zingare e Pastori: Symbols and Allegories in Italian Renaissance Music.” Angels were represented by wordless performances of four Latin motets, plus one of Salamone Rossi’s unique settings of verses from the Hebrew Bible. Shepherds presumably would have participated in dances such as Orazio Vecchi’s “Gitene Ninfe.” But I could not detect anything even vaguely Roma in the selections (a zingaro is an Italian gypsy). Any symbols and allegories were hidden in the unsung texts of the works arranged from vocal numbers. The repertory was actually less “Renaissance” than from the later period that we regard as the transition to the Baroque. Most of the works were from the two or three decades on either side of 1600. Although not all were originally written for instrumental consort, the eclectic mix of music by both familiar and obscure composers was potentially very interesting. Before the performers appeared, the stage was already arranged with about 30 “Renaissance” recorders ranging from small piccolo or sopranino instruments upright on stands to a monstrous double bass lying on the floor (how historical some of these instruments are is open to question). It was certainly entertaining to watch and hear a constantly changing combination of such instruments taken up and played—entirely from memory—in nearly perfect intonation, and with perfect ensemble. This sort of spectacle has been one of the attractions of early music since the modern tradition began a century ago. But for one who is not an enthusiast, the ravishing effect of the sound of massed recorders quickly fades. The homogeneity of an all-recorder ensemble makes it most effective in relatively simple pieces, as in the forthright harmonies of the opening “Intrada” by Alessandro Orologio. I was almost convinced as well by the performance of “Viri Galilaei” by Palestrina, one of that master’s less contrapuntally complex works. On the other hand, the intricate counterpoint of ricercars by Frescobaldi and Andrea Gabrieli was, through no fault of the players, largely opaque. Girolamo Cavazzoni’s “Falt d’argens”—an arrangement of a polyphonic chanson originally by Josquin Desprez—became a solo for Leenhouts, playing an elegantly embellished upper line to the rumbling accompaniment of two bass and one contrabass (or was it a sub-contrabass?) recorder. This last work was performed by a quartet, but the majority of the program was played by the whole group of 13, and this listener found many of those items quite problematical. Leenhouts, who is director of early music studies at the University of North Texas, also led the UNT Baroque Orchestra earlier in BEMF week, in a “fringe” concert sponsored by Early Music America. That performance, like this one, was technically accomplished. But, again like this one, it belonged to a type that in today’s early-music world seems increasingly old fashioned: a large ensemble conducted in the modern manner by a director who has evidently made all the important musical decisions himself. Leenhout’s creative contribution to Sunday’s performance went well beyond what we know of historical practice. At least eight of the selections were arrangements of music for lute or keyboard. Any professional wind or string player of the 16th or early 17th century was probably prepared to play stylishly from parts that were originally meant for the singers of a motet, a French chanson, or an Italian madrigal. But the same player could not easily have performed music written in keyboard score or in the tablature notation used by lute players. 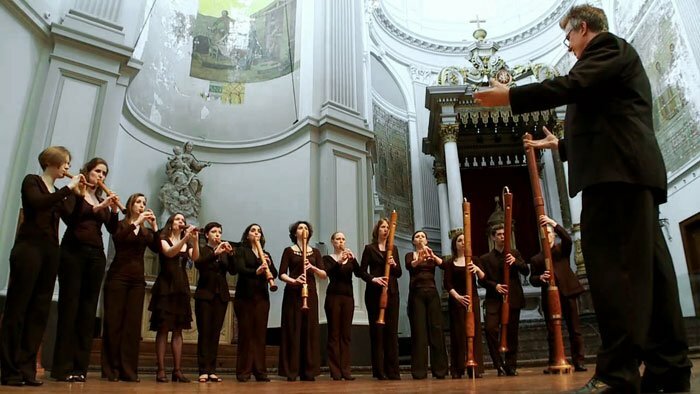 Like Respighi’s Ancient Dances and Arias—early 20th-century arrangements of Renaissance lute pieces—Leenhout’s arrangements for massed recorder ensemble are orchestrations that belong to a specifically 20th-century tradition. One problem with this is that when two or three recorder players must double up on a line designed for a single singer or player, the effect can never be the same as when a soloist performs it. I was actually impressed by the players’ expressive unanimity in a few passages. But more often I felt that the music suffered under the tyranny of a conductor. The doubled embellishments in the “Consonanze stravaganti” by the Flemish composer Giovanni de Macque seemed to me grotesque: mechanical where a soloist’s freedom was called for, and hardly bringing out the startling “extravagant harmonies” of this proto-Baroque composer (who worked for Gesualdo). It did not help, here and in other pieces, that the bass, and sometimes other parts, was doubled at the octave—an orchestral effect that gave this music an unnecessarily thick and heavy sound. At the risk of going on unduly in this manner, I must also point out that the frequent juxtaposition of music from different places and periods did not make for a coherent program. The beautiful little motet “Adoramus te, Christi” by Paolo Agostini, active at Rome a generation or two after Palestrina, was sandwiched between two much earlier and more mediocre works by the north-Italian composers Jacopo Corfini and Ascanio Trombetti. A fine instrumental canzona by the early-Baroque composer Tarquinio Merula, “La Chremasca,” received a lively performance. But it was followed by an older and more austere piece by the organist Gioseffo Guami that in this context made little impression, at least on this listener. In a program of brief selections, a work can be over before a listener has adjusted to a fundamental change in style. Guami’s serious polyphony, somewhat in the manner of Andrea Gabrieli, might have made more sense as part of a set of like pieces. Many who attended the performance will differ with my views. Yet the standing ovation that some gave it seemed to me to have been earned only by its technical accomplishment. Those numbers that were originally for voices might have been moving if sung well, or if they had been graced by the type of expressive diminution that instrumentalists of the period sometimes added. But the performances tended to focus on virtuoso aspects of the music, sometimes as well on humorous quirks, to the detriment of deeper elements. For instance, an arrangement of a keyboard ricercar by Frescobaldi was played with humor that reflected the composer’s self-imposed rule in this piece of avoiding all melodic motion by step (the lines move only by leaping). Yet this was one of several pieces in which an excessively chirpy approach, combined with a very lively tempo, eliminated the possibility of an expressive melodic line, leaving the music merely entertaining. The last four numbers—early-Baroque dances by Rossi and the Neapolitan organist Trabaci—were significant works, but I did not feel that they were well served by Leenhout’s versions, which seemed to me overblown (figuratively speaking). This was the second wind-band concert of this year’s festival, following the “Symphonie des Dragons” directed by Gonzalo Ruiz on Tuesday. (Disclosure: Ruiz is my colleague in Juilliard’s Historical Performance program.) But whereas the latter was a focused recreation of the late-Baroque double-reed band, the present concert was a wide-ranging exercise in creative anachronism. All “early music,” of course, might be described as such. But what was anachronistic in this case was the dated, quasi-orchestral approach to works that were composed for soloists and chamber musicians. This program was well executed, and for many it was great fun to listen to—but it gave a monochromatic view of a diverse repertory. I think the concert would have been better served with a review by one who was an “enthusiast” rather than a lecturer who indeed “risked going on unduly in this manner” with comments that served little purpose as a review. We did come to know that Mr. Schulenberg is both well informed in musical history and a very unhappy listener. This review was unfortunate for all concerned. it even resonated with our cultural milieu (we were staunch “Litvaks”.) Such sensible and learned arguments could not be easily countered, but one of our critiques finally persuaded: the stuff tasted ghastly and was no fun to eat. That worked…no more Kasha. She starting serving up matzah brei. Perhaps not as healthy, but good enough for you, and much more fun. Certainly it is pleasant to hear homage paid to “historical practice” at an early music concert. But shouldn’t there be other things on the plate? To hear how smart, imaginative musicians use their impressive chops to sound out the sweet,old tunes. Isn’t that also a wonderful thing? I go out to hear musicians play music. No more kasha. I go for the matzah brei. God bless you Jonathan. Well put. You said many things that I also echo, and so much better than I could have said.